Do you know something about our history? We're looking for information, photos, documents, or artifacts about the early years of South Coast Orchid Society, particularly concerning the Fourth Annual Western Orchid Congress held November 11-13, 1955, with our sponsorship, at the Lafayette Hotel in downtown Long Beach (with judging by Orchid Digest), and the Fifth World Orchid Conference held in Long Beach in 1966. Also, we would like to reconstruct a record of the Presidents of SCOS from its founding in 1950 right down to the present. So far, we've only found half of them. Another topic of interest is our participation in the development of judging standards. It appears SCOS used Orchid Digest judging standards until 1968, when the standards of the American Orchid Society and Orchid Digest were "merged" in some way, and the judging center supported by SCOS became a "Supplemental Center" for AOS judging. Please contact the web master if you can shed any light on these events. 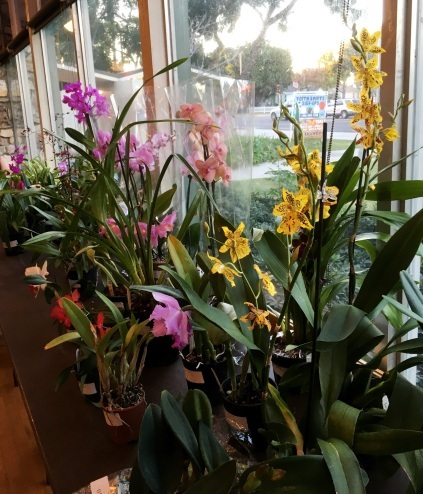 South Coast Orchid Society, Inc. is a tax-exempt 501(c)(5) organization promoting the cultivation, appreciation, and conservation of orchids. We were founded in 1950 by local orchid hobbyists and growers. We are an affiliated society of the American Orchid Society (AOS) and of The Orchid Digest Corporation. Our main activities, including our monthly meetings and our annual auction, are open to the public. For information about donations, please contact us! We meet monthly, usually on the fourth Monday of the month, unless there is a conflict due to holidays or inavailability of the meeting hall, at Whaley Park, 5620 Atherton Street, in Long Beach, California. The program presented by our featured speaker begins at 7:30 pm — see the current newsletter for details! However, one of the highlights of our meetings, and a good reason to arrive by 7:00 pm, is the astonishing assortment of blooming plants that our members bring for informal ribbon judging. Most of these plants have been grown outdoors by our members! In addition, there is usually a silent auction for a few selected plants, and, at the end of the meeting, a raffle for plants donated by vendors or individuals to benefit the society. 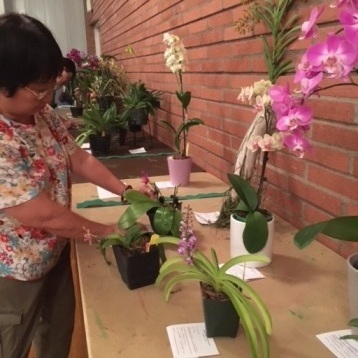 One of the best ways to learn about orchids is to spend some time examining the plants at our meetings, and discussing them with other members. For more information on topics that have been discussed in our meetings, see our new blog, Orchids Today and Yesterday. We are also looking for pictures of our meetings, past and present, as well as any stories, newspaper clippings, etc. that you may have collected, for possible use on our web site and other publicity activities. Please contact the web master. In conjunction with our meetings, the society also hosts a formal judging center under the auspices of the American Orchid Society. 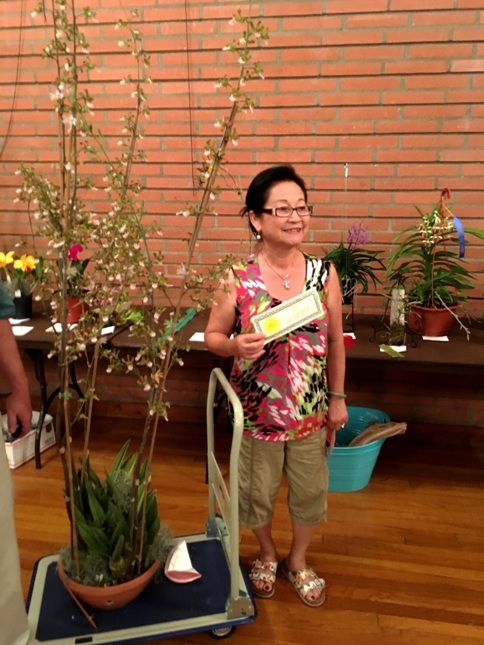 The AOS judging program recognizes orchid plants of exceptional merit. Plants are brought in for judging by some of the best growers in our area, amateurs as well as professionals. The judging center is open for visitors, an excellent opportunity to see what judging is all about, and also an opportunity to see some truly exceptional plants. There's more information about our judging center here. Every October, we devote our meeting to our annual auction, our main fund-raising event of the year. The proceeds from the auction help us pay for the activities of the society, such as the rent for the meeting hall (including the AOS judging center) and fees for speakers. The annual auction usually includes hundreds of plants of many types, donated by local vendors and individuals, most of them suitable for growing at home. Among the plants being auctioned, there are often divisions of very desirable species and hybrids that are not usually available at nurseries. Please see our separate web page about the SCOS 2018 Annual Auction for the latest information. We have recovered some of the names of our past presidents from old newsletters, newpaper clippings, obituaries, etc. Please help us fill in the gaps! We honor our predecessors for their care in creating a legacy of service to everyone who enjoys orchids today.